He has confirmed that it will not go to Cabinet tomorrow. It was previously previously suggested by Taoiseach Leo Varadkar that the matter would be considered by ministers before Easter. The NBP process has been beset with delayed and difficulties. There is just one remaining bidder in the process. Communications minister Mr Bruton said: "We have as you know been doing the due diligence on this. I think we’re close to completion on that." He said it's a "significant decision" and "time and space" is needed for it. Mr Bruton also said there is "no intention to drag out this process" and there is a "determination to reach a decision in a timely way. But it is an important decision and it is one that we’re determined to get right." He said: "It has been acknowledged that this isn’t a cheap investment and the government have to make a decision whether this is an investment that we’re willing to make." Fianna Fáil Communications spokesman Timmy Dooley called on Mr Bruton to clairfy when he intends to bring NBP proposals to Cabinet. He said: “In November of last year, the Minister for Communications indicated that he would bring a recommendation to cabinet on the National Broadband Plan within weeks. Fast forward five months and there is still no movement – it is deeply frustrating." 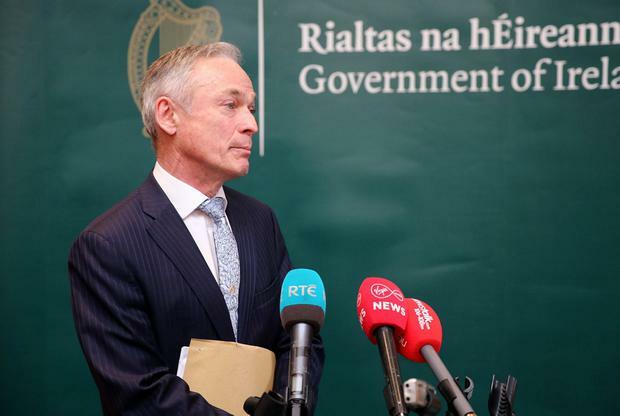 He said Mr Varadkar later said that there could be a decision made before Easter and it was widely expected that Mr Bruton would bring a decision to Cabinet tomorrow. He said Mr Bruton has now confirmed this will not happen. Mr Dooley claimed this is "a disgraceful betrayal of the people who have been waiting for so long and who depend on this rollout." Kevin Doyle The future of the Government could now depend on its ability to rescue the National Broadband Plan (NBP) from the brink of collapse.